Blackjack, or 21 as it is commonly known, is the most popular casino game played against the banker. It is played legally in casinos and gambling houses in many Western, Asian and European countries. The first known reference to 21 was in Spanish author Miguel de Cervantes’ book published in the 1500s, but it only became known as blackjack when the game became popular in America in the early 1900s. These days there are high-stakes games played where USD $1 million might be wagered on a hand, while some land-based casinos in the USA, Australia and England might have tables for as little as $5 per hand or its equivalent. While there are many games spawned from blackjack, some of them top-shelf, this article teaches you how to play Liberal Vegas, or standard rules. To win at blackjack you need to beat the dealer without going over 21. Often people play by the rule of getting as close to 21 as possible, without taking into consideration what card the dealer has; this is the ultimate rookie mistake. 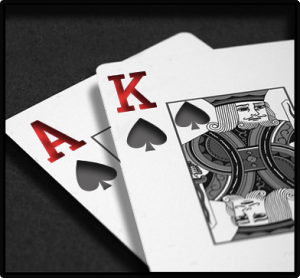 The simple premise is you are given two cards, with an Ace-Jack hand being blackjack (21) and the best hand a player can get. When you get blackjack you are immediately paid out, before you see the dealer’s hole card. If the game continues past this stage, you are asked whether you want to hit or stand. 1 – You can play blackjack with anywhere between one and eight 52-card decks. 2 – Aces are worth one or 11 points, 2 to 9 are worth their face value, 10s and face cards are worth 10 points. 3 – A blackjack (Ace-10) is the highest hand in blackjack, outranking every other 21 combination. The total of your cards (as above) are what score you are on. 4 – Players will be asked to place bets. When this has concluded the dealer will give two cards to each player at the table. They will also give themselves two cards, one face up, the other face down (known as the hole card). 5 – If the dealer is showing an Ace, you will get the option to buy insurance. This bet is 2 to 1 and pays if the dealer’s hole card is worth 10. You are not forced to buy insurance in blackjack. Once insurance is offered the dealer will check their hole card to see if they have a blackjack. If they do, the game is over and all bets except insure bets lose. If the player also has blackjack it is a push. Hit: Ask for another card or tap the table, as is custom in many parts of the world when you want another card. Players can request as many cards as they want, but will ‘bust’ if they go over 21. Stand: The player opts for no more cards, settling for what they have. Double: The player doubles their bet, but receives only one more card. Split: When the player has two of any card of the same value, they may split them into two individual hands, including face cards. When Aces are split the player gets only one more card, while doubling after splitting is not allowed in some casinos. A player can only get 21, rather than blackjack, after splitting cards. Surrender: The player forfeits half their stake after seeing the first two cards. You don’t find this rule in many casinos around the world. After players have had their go, the dealer will turn their face-down card over. The dealer will always hit if they have 16 or less. If the dealer has an Ace and any number of other cards equalling 17 it is known as a soft 17. In some casinos there may be a rule that the dealer hits on soft 17. Winning bets pay even money, while a blackjack pays 3 to 2. Some casinos have introduced a rule where it’s a push if the dealer scores 22. This is a rule which heavily increases the house edge and must be avoided at all costs. You will find there are many casino games which are an off-shoot of blackjack. Some French versions are even thought to be the original game. 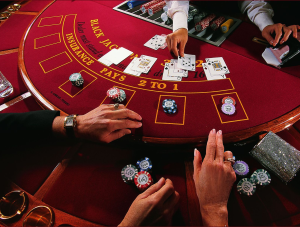 In land-based casinos around the world some of the more common blackjack variations include Liberal Vegas Rules (standard), Pontoon, Spanish 21, Atlantic City and Chinese Blackjack. But the internet has spawned (at a guess) another 50 or 60 different games, with subtle rule variations, such as the dealer having both cards face down. You can play these games at online casinos or even on social media sites such as Facebook and Google Plus. There are plenty of rules variations that may affect your odds of winning. The single most important variation to consider from one casino to another is the number of decks employed. The rule of thumb is the fewer decks the better. The use of four decks reduces your odds by 0.54% compared to a one deck game. Another rule is the policy concerning dealer hands of soft 17. The most common rule is that the dealer stands on all 17s (including soft hands) which is good from the player’s point of view. Casinos that allow their dealers to hit on soft 17 hurt your chances of winning by 0.2% compared to those who don’t. If there is an online casino without blackjack available we have not found it. There are literally thousands of online casinos, which makes it tough for players to choose where they should play. Firstly you need to consider how you are accessing the casino, meaning are you on a PC, a Mac, smartphone, television or even a tablet? Once you have made this decision you need to find a casino catering for you and your currency. For instance, US players might be limited as to what casinos they can play at, as are many players in Asian countries. The biggest online games provider is Microgaming, who have been around for more than 20 years and power some of the biggest casino brands in the world. 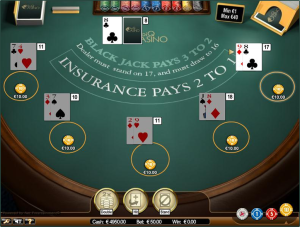 If you choose to play at a Microgaming casino you will have the option of downloading a software package, or playing at their instant-play casino, if you are playing on PC or Mac. MG casinos usually have a standard mobile website which is frequently updated with games. Other casinos use software providers such as BetSoft, Playtech, NetEntertainment and Betfors with hundreds of different random number-generated and live dealer blackjack titles available for players worldwide. Often a casino will give you a set amount of time to trial their product before you are forced to play for real money. Some casinos even waive the set time and allow you to play for as long as you want. Be aware that when you are playing online there are many different versions of blackjack available, with varying rules, which can greatly increase the casino’s advantage over you. But if you are smart and do your research you can find games with the most advantageous house edge advantage for players. Card counting isn’t really a topic for beginners, but here is some basic information about card counting anyway. It may help you decide if card counting is something you should try or not. Playing basic strategy correctly is often enough to get a close to even game, however to achieve a long term advantage for the player, card counting techniques must be used. There is no point in trying to learn how to count cards without first knowing the basic strategy correctly, so make sure you first know the basics before attempting to learn advanced techniques. Most people think that card counting means that you have to memorize every card as it’s played. Fortunately, there is a much simpler way. It requires no memorization at all, just some very simple arithmetic. The key is to assign a plus or minus value to each card in the deck, then to total these values as each card is dealt. All the cards from the 2s to the 6s hurt your chances of winning. It’s to your advantage to have those cards removed. For that reason, you will assign a +1 value to each of these cards and add +1 to your count each time one of these cards goes out of play by being dealt to someone’s hand. Through the game, you keep a running computation of each card as it is dealt. Your count begins at zero before any cards have been dealt from the deck or shoe. You must re-calculate your running count when playing in a multiple-deck game. You keep a running count just like in a single-deck game, however before deciding how much to bet on a hand you must first convert the running count into a true count. You do this by dividing the count by the approximate number of decks still un-dealt. You can either look at the shoe and estimate about how many decks are left in it, or you could look at the discard rack to get an idea of how many decks that are left in the shoe. The total you arrive at is your true count. Your disadvantage is usually about 0.5% at the start of a new shoe, and your odds improve with about 0.5% for each true count. For example, your advantage would be about 1.0% with a true count of +3. Blackjack is often portrayed in Hollywood films, with the general theme usually being a card counter attempting to rip off the casino. Card movies are incredibly popular and the team here at the World Gambling List has a few favourites. 21: 21 is based on a true story about five MIT students who learn card counting off a cunning mentor, before winning millions of dollars in Las Vegas casinos. There is no denying the brilliance of the real life MIT students but the movie portrays winning as far easier than it actually is. Having said that, this is a great film and definitely one of our favourites. Rain Man: Rain Man got the nod as the most popular blackjack movie from the WGL team. It was released in 1988 and features Tom Cruise and Dustin Hoffman as two brothers. Hoffman is autistic but has a brilliant memory and, in turn, turns out to be brilliant at blackjack. This movie is another which has used blackjack as a theme in what is an engrossing story-line. 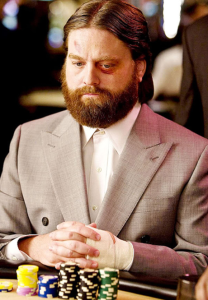 The Hangover: This movie was filmed in 2009 and, while not purely about blackjack, it does feature a revved-up Zach Galifianakis killing it on the blackjack tables of Las Vegas. We really can’t link it back to blackjack any more than that, but watch this movie.